Autumn can be a time of abundance, decadent overgrowth and plentiful harvests, but it’s also a time when plants start to decay and die back as the first frosts of autumn hit or the winds come howling in. I came back from nearly two weeks in the US celebrating my son and daughter-in-law’s wedding with her American friends and family to find my allotment full of weeds, dahlias still flowering in gay abandon and my bean frame horizontal – I’m guessing we’ve had some strong winds in my absence! The calabrese plants appear to be flowering, despite not showing any signs of heads before I went away, and there are lots of windfall apples on the floor. On the plus side, the spinach and chard I’d sown in early September are looking really good, as is the kale and purple-sprouting broccoli, and even the bulb fennel hasn’t gone to seed – a first! The courgette plants are looking very sorry for themselves, not quite frosted, but definitely browning, although I still managed to harvest a few decent courgettes – I’d picked all incipient fruit before I left to avoid coming back to marrow armageddon…. That reminds me of a couple of new courgette recipes I experimented with this year, but haven’t had time to jot down with all the wedding goings-on this summer. I’m always on the lookout for new ways with courgettes, especially in such a hot year when new courgettes were forming on a daily basis at the height of the season. Heat the oven to 200°C / Gas 6. Top and tail the courgettes, then slice lengthwise into thin slices about 5 mm thick. Place on a foil-lined baking tray, brush with olive oil and roast in the hot oven for 15-20 minutes or until just golden and soft, but not mushy. In the meantime, fry the onion and garlic in olive oil until soft, then add the minced pork (or turkey) and cook for a further 5 minutes until browned. Add the spices and harissa and cook for 1 minute, stirring constantly, then add the tomato purée and the chopped tomatoes with their juice. Stir in the chopped herbs and season to taste. Place a layer of sauce in the bottom of a rectangular dish (20 x 25 cm), then a layer of courgettes and continue until all used up, ending with a courgette layer. Blend the yogurt, beaten egg and seasoning in a small bowl, then pour over the courgettes and top with grated cheese. Bake for 25-30 minutes or until golden brown. Serve hot with a green salad. Freezes beautifully too. In another bowl rub the butter into the flour, baking powder and a pinch of salt until it looks like breadcrumbs. Stir in the fresh thyme leaves. Add most of the grated cheese and courgette and mix thoroughly. Add enough milk to make a soft dough that’s not too sticky (add more flour if necessary). Gently roll out the dough to 2cm thick and cut into rounds with a pastry cutter. Place the scones on a greased baking tray and bake for 10-15 minutes. They should be a nice golden brown and well risen. Serve with butter and a bowl of steaming homemade soup. Once again, these freeze well and are ideal to have in the freezer for emergency lunches or unexpected visitors. Still on the baking theme, I also found a delicious recipe for chocolate & courgette brownies a great way of getting rid of excess courgettes AND adding extra vegetables to boost the 5-a-day count of unwilling veg eaters! I found it here, but have adapted it slightly and record my version here for reference. Once again, these freeze well, which is great if you live alone and don’t want to eat them all at once! The problem with vegetable-based cakes in warm weather is that they can go off within a matter of days in the tin, so freezing is definitely the way to go. Pre-heat oven to 160℃ fan / Gas 4. Grate the courgettes and place in a colander over the sink, then sprinkle with salt. Leave to drain for 15 minutes or so, while you get on with the brownies. Place the chocolate and butter in a microwaveable bowl and microwave on high for 1 to 2 minutes in 30-second bursts until melted. Stir until chocolate is nice and smooth and leave to cool. Alternatively melt the old-fashioned way in a glass bowl over a small pan of simmering water. Leave to cool. In a large bowl, whisk the eggs and sugar together using an electric mixer until doubled in volume (about 5 to 8 minutes depending on your mixer). Add the vanilla extract. Carefully pour the cooled chocolate into your egg mix and gently fold together with a metal spoon. 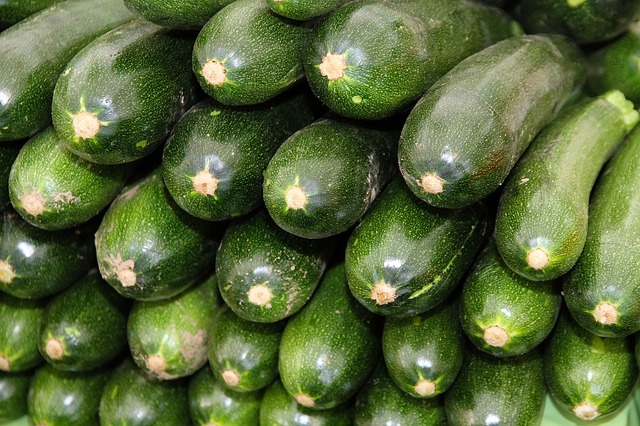 Rinse the courgettes to wash off the salt, then transfer to a clean tea towel and squeeze firmly to remove excess liquid. Fold the courgettes and toasted chopped nuts into the brownie mix. Sieve the dry ingredients into the mixture and fold in carefully. Pour mixture into the prepared tin and cook for 30 minutes. Check to see if there is a paper-like crust on top – there should still be some movement in the centre of the tin. Bake for another 5 minutes if you don’t think it’s cooked enough, then take out and leave to cool. They will firm up on cooling. Cut into 16 individual portions when cool. My final suggestion is barely a recipe, more a reminder of my favourite and simplest way of serving courgettes as a side dish. Again no photo – I’m getting lax! I cleaned up my photos before going to the US so I’d have space to take lots of new pictures, and have clearly been overzealous. Cook the onions and garlic in a frying pan with the olive oil for about 5-10 minutes until starting to soften. Add the courgettes and cook for a further 5 minutes, then add the chopped tomatoes, herbs and seasoning and cook until a thickish mixture forms. 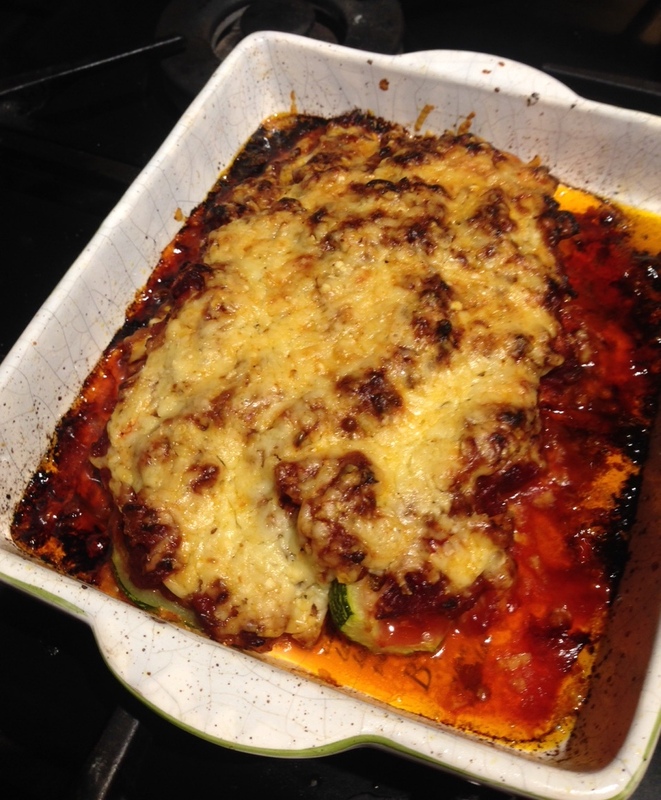 Transfer to an ovenproof dish, mix the grated cheese and breadcrumbs together and sprinkle over the courgette mixture. Cook in a hot oven at 180°C/gas 5 until the cheese is starting to brown. Serve with sausages, chops or on its own as a delicious vegetarian main. The recent sunny days, yet cold nights of this lovely spell of early autumn weather have more or less put an end to the courgettes. Mine are hanging on in there, but I really don’t think I’m going to get much more fruit now. In any event, I’ve earmarked their current position for next year’s broad beans, which I like to sow in late October/November for an early and hopefully problem-free crop next May/June. I plant the variety ‘Aquadulce Claudia’, one of the best autumn-sowing varieties, and find they make a good start before the worst of the winter, regrowing all the more strongly next spring. In contrast, my neighbouring plotholder’s spring-sown plants never really came to anything in this late, cold and dry spring, so I felt doubly glad I’d opted for autumn sowing – plus it’s one less thing to sow next spring! The courgettes haven’t been wonderful this year either, I must admit. I had seven plants: four green ‘Defender’ and three golden ‘Soleil’, but the yellow ones, in particular, were dreadful: the fruit set, but never grew to full size. The Defenders were fine, just not quite as bountiful as usual, which was fine, but meant I wasn’t giving them away left, right and centre as usual! Time to try some new varieties next year, I think… I still have three or four in the fridge, and have been meaning to note down my favourite courgette recipes, so here goes: better late than never! I first tasted these many years ago in a trendy little restaurant (Randalls) in the back streets of Bollington, on the Cheshire fringes of the Peak District – divine! They are quite a last-minute thing to cook, so probably best not attempted for a dinner party, but if you’re cooking a family meal or informal supper where you can stand and cook/talk at the same time, these are a delicious way of using up a glut of courgettes! Cut the courgettes into 5-6cm lengths, than half and quarter each length, so you have 4 batons. Place in a colander, sprinkle with salt and leave to draw out excess juice over the sink. Rinse and dry well in an old tea towel to remove salt. When a cube of bread added to the pan sizzles and turns golden, the oil is hot enough to start the fritters. In the meantime, whisk the egg whites until stiff, then gradually fold in the flour and chopped dill if using. Toss the dried courgette batons in the egg and flour mixture and add to the hot oil in the pan one at a time, using kitchen tongs. Don’t add too many to the pan in one go, as otherwise the oil will lose its heat and the fritters won’t cook sufficiently quickly. When golden brown and crispy, lift the fritters out individually with tongs and leave to drain on the tempura rack (or on kitchen roll) while you cook the rest, using as many batches as you need to avoid overfilling the wok. Serve hot as a side dish and enjoy! This is one of those favourite recipes scribbled on a bit of paper in my trusty recipe scrapbook and one I turn to several times each year. I think it first appeared in my organic vegetable box when I was tragically between vegetable plots. We’d moved house, but not had chance to grow any veg or take on the allotment, and I discovered a lovely local box scheme in the next village. They didn’t deliver and you had to drive down a very rutted track to reach the farm, but it was worth it for the fantastic smell of fresh basil when you walked in! They always added a recipe sheet in the box and this, I think, was based on one of theirs. Place grated courgette in a colander and sprinkle with salt. Leave to stand over the sink for about 15 minutes. Rinse well to remove salt and dry extremely thoroughly in an old tea towel, squeezing to remove surplus water. 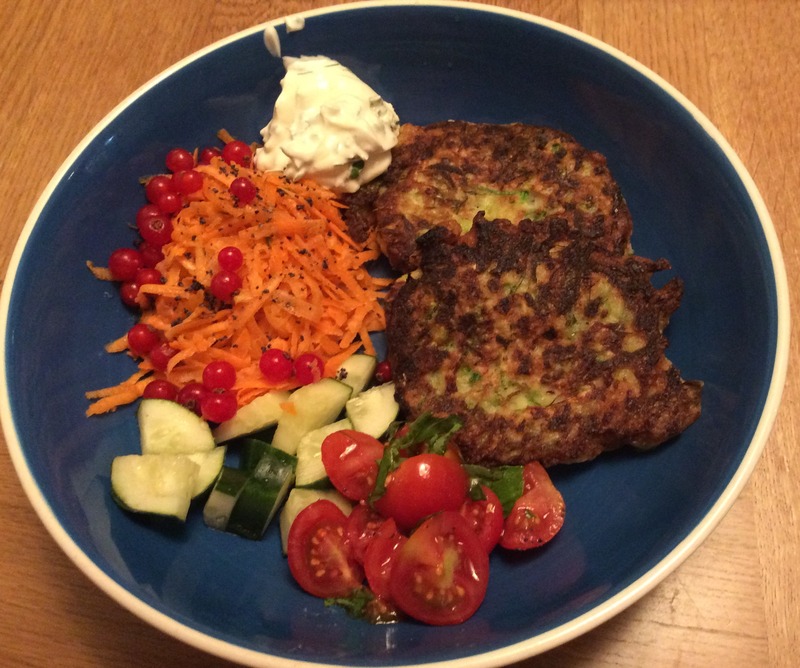 Mix courgettes with egg yolks, feta, onions, dill (if using) and flour, then season to taste. Beat egg whites in a separate bowl until stiff, then fold into the courgette mixture. Heat the butter and olive oil in a large frying pan and add spoonfuls of the mixture to cook over a medium-heat. The mix is quite soft, but you should be able to turn the pancakes with a fish slice and palette knife when one side is cooked. Cook on the other side until golden and serve straightaway with sour cream or crème fraiche on the side. In the height of summer, I serve these with a green salad and chopped cherry tomatoes, sprinkled with olive oil, balsamic vinegar, basil, garlic, a hint of sugar and seasoning – delicious! 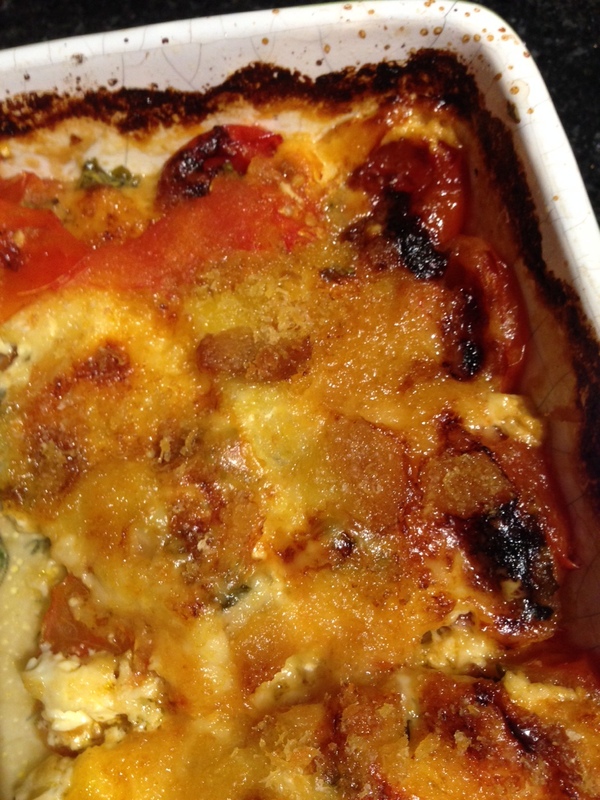 My final recipe is another old favourite from the Sainsbury’s Sarah Brown Vegetarian Cookbook back in the 1980s. It’s a filling, yet delicious vegetarian main course and tastes good both hot and cold, so ideal for picnics or leftover working lunches the next day. Cook the lentils in twice their volume of water for about 10 mins or until soft. Beat with a wooden spoon, then drain off any excess liquid. Heat the oil in a frying pan, then cook the onion and garlic for about 4-5 minutes until starting to soften. Remove from the heat, then add the cooked lentils, tomato purée, oats, lemon juice, herbs and seasoning. The mixture should be thick enough to hold together. If too wet, either return to the heat to dry off a little more, or add some more oats. Press the mixture around the sides and base of a greased 8” flan dish. Meanwhile, either steam the courgettes for a couple of minutes or cook them with a knob of butter in the microwave for 2-3 minutes. Drain off excess liquid if microwaving. Blend the eggs with the flour, then add the milk. Stir in the cooked and drained courgettes, chopped basil and seasoning. Spoon the filling into the flan case, top with grated cheese and cook for 180°C (fan), Gas 5 for about 25-30 minutes or until set. Serve warm or cold with a salad. Returning home from a 10-day working trip in France this weekend, the garden seems to have been ultra-bountiful in my absence. 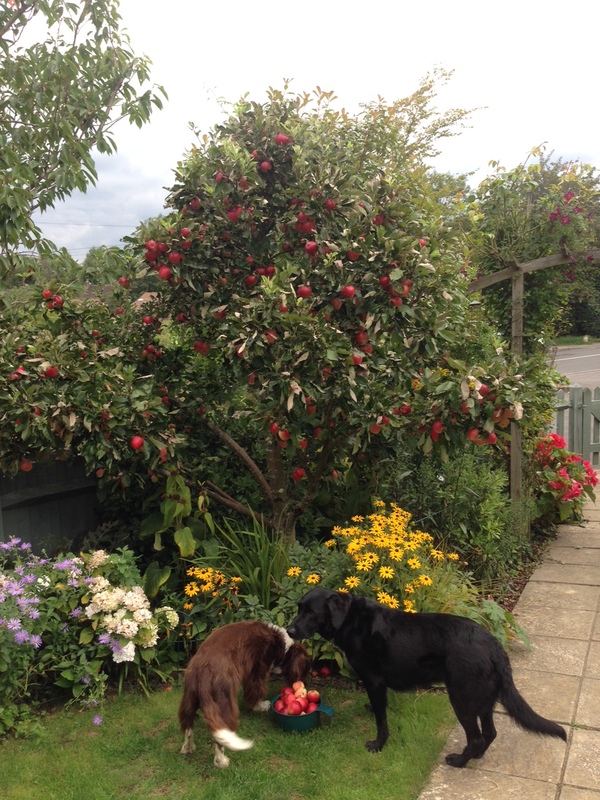 The Katy apple tree, a delicious red eating apple along the lines of Discovery, has shed most of its fruit now, always an early arrival, and friends have kindly left bags full in my fridge. The tomatoes have also ripened beautifully, despite, or perhaps, because of the plentiful rain, and I haven’t dared check out the allotment yet, but the rather large courgettes taking up residence in my fridge suggest they have been productive too! I’m hoping to spend the day down at the allotment tomorrow, so will doubtless have even more bounty to process then…. Having eaten at rather strange times in France due to my working hours, I’ve been really looking forward to simple fruit and vegetable meals again – just as well, really! For tonight’s meal, after a day getting straight with unpacking, washing, sorting out paperwork and generally relaxing, I had the urge to make something akin to Aubergine Parmigiana, but sadly my only remaining aubergine is just a couple of inches long and probably won’t come to anything this late in the season. I decided instead to create a tomato dish, inspired by the aubergine recipe, but using just tomatoes. I served it with pork and leek sausages from my local farm shop and it was everything I’d imagined: see what you think! Halve the tomatoes and line up in neat rows in a gratin dish. I used cherry tomatoes as that’s what I had most of, but you can use standard tomatoes too – just increase the initial cooking time in that case. Sprinkle with chopped garlic, chopped basil, then drizzle with olive oil and a dash of balsamic vinegar. Roast in a pre-heated oven at 200°C / Gas 6 for 20 – 30 minutes depending on size of tomatoes. They should be starting to soften and release their juices. Top with spoonfuls of fromage frais, spreading out as best you can; it doesn’t matter if it’s not all covered. Then add thin shavings of Gruyère and top with the breadcrumbs (I use frozen for ease, prepared in the food processor when I have excess bread to use up). Turn the oven down to 180°C / Gas 5 and cook for 30 minutes or until golden brown and crispy on top. Serves 4 as a vegetable side dish with meat and potatoes or 2 if just serving as a substantial side with sausages or chops. Peel and core the apples, slicing each apple into 8 or so segments. Sprinkle with lemon juice to stop browning as you prepare the rest. 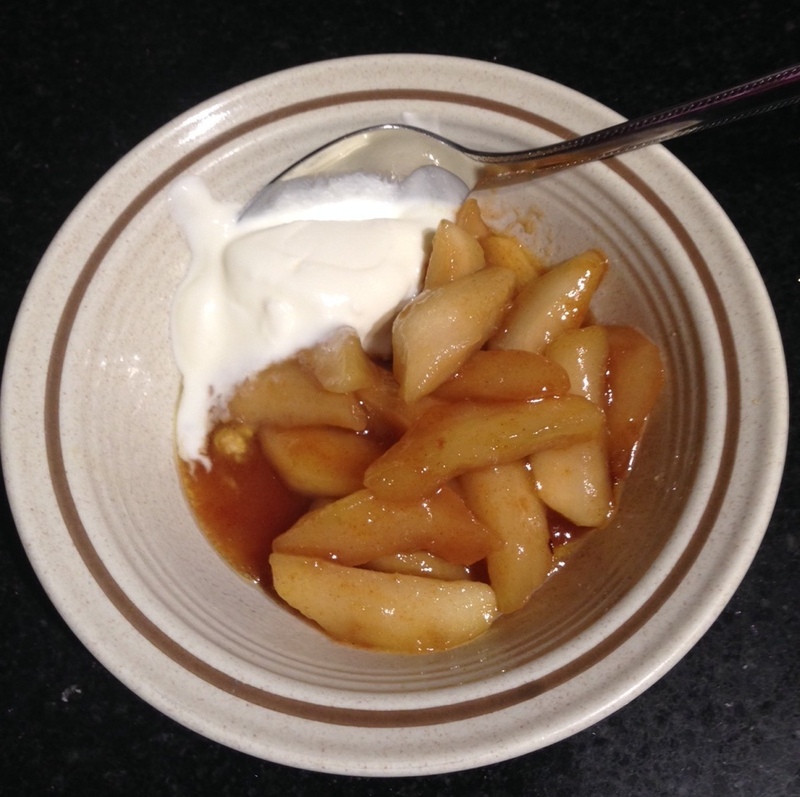 Melt the butter in a small frying pan and add the apples. Cook over a relatively gentle heat for 15 minutes or so until starting to soften. Add the vanilla sugar and a sprinkle of cinnamon to taste, then cook for a further 10 minutes until the liquid looks syrupy. Add a dash of Calvados and cook for a further few minutes. My final recipe is one I shall cook tomorrow night to make inroads into the courgette stockpile. It was suggested by a very good friend of mine after we’d shared a foodie/garden-visiting weekend together earlier this year and makes a scrumptious and substantial vegetarian feast. The first time I made it, I adapted it slightly to use up the remains of a Puy lentil and beetroot salad I had in the fridge, but you can equally well use lentils from scratch. Just cook in water for 20 minutes or so according to the instructions on the packet. Halve courgettes lengthwise and hollow out flesh with a sharp spoon. Chop the flesh and reserve. Blanch the courgette shells in boiling water for 1 minute, then drain and place in a rectangular gratin dish. Sauté the chopped onion, garlic and chilli until soft, then add chopped courgette flesh, cumin and coriander, chopped tomatoes, basil and tomato purée. Cook down for a further 10-15 minutes, then stir in the cooked lentils and beetroot (if using). Cook for another 10 minutes or so until well blended; fill courgettes with the lentil mixture and top with grated Cheddar cheese. Cook in a hot oven (180°C / Gas 5) for 25-30 minutes or until golden.